Astec Power, now a part of Emerson Network Power, manufacturers a broad range of DC/DC Converter products. Astec Power Supply product lines includes a family of high-power brick DC/DC Converters in full-brick (AIF), half-brick (AIH) and quarter-brick (AIQ) configurations designed to be used with Power Factor Correction modules. These standard products include monitoring and adjustment and allow for the design of a full-featured power supply with minimal engineering investment. Astec DC DC Converter product families that are now obsolete but which have a large installed base are the BM80A series of 48V and 300V converters offered in a full-brick configuration and the AA10U series of 12V, 24V and 48V converters offered in a quarter-brick configuration. 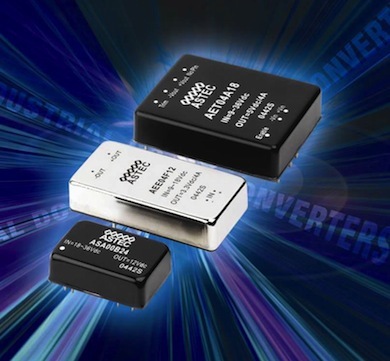 Procure International offers both current production and obsolete DC/DC Converters from Astec Power at very competitive prices and short lead times. Search for the Astec Power DC DC Converter Modules you need using the Part Number Search bar at the top of this page, submit your RFQ to get pricing, and place your order directly online using our secure online ordering process.